Fairytales have long been fair game for transformation. Even the best loved of our childhood stories have gone through multiple versions, from Brothers Grimm to Disney animation. There’s a precedent, then, for Sally Cookson’s playful, gender-switched reworking of Sleeping Beauty, which tells a familiar story in unfamiliar style. Instead of the princess catching Zs, at the Bristol Old Vic it’s a prince. Prince Percy (David Emmings) – after a childhood wrapped (quite literally) in cotton wool – has been cursed to snooze for a hundred years, awaiting the kiss of his one true love. The hero, meanwhile, has been imported from Welsh folk tale The Leaves That Hung But Never Grew. Deilen (Kezrena James) is a resourceful but lonely adventurer, who stumbles across the unresponsive Percy while on her own quest and sensibly administers mouth-to-mouth. It might not be Sleeping Beauty as we know it, but Cookson’s version – devised with the multi-role-playing company of eight – is all the more charming for the reinvention. 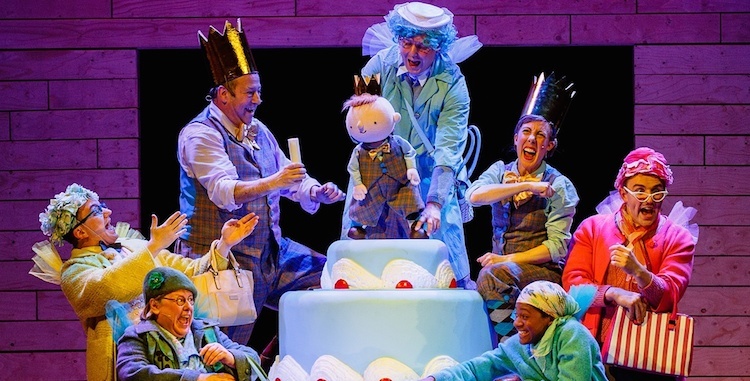 Tongue-in-cheek irreverence is balanced with true fairytale magic, reimagining rather than bulldozing long Christmas show traditions. Nowhere is this more evident than in the supporting cast of fairy godmothers, spells intact but gleefully transformed into a lineup of cake-baking, knitting-needle-wielding WI members. There’s also more than a hint of panto to Cookson’s joyful production. Cross-dressing aplenty – often with brilliantly ridiculous wigs – meets the demands of the large cast of characters, while Stuart Goodwin’s deliciously evil baddie anticipates the hisses from the audience. Where Sleeping Beauty differs from the glitter and garishness of other festive offerings, though, is in its relative simplicity. Michael Vale’s elegant and versatile wooden design transforms instantly from climbing frame to castle, while the songs are all courtesy of an onstage, ad-libbing trio of musicians. Though much is gained from mashing up two separate stories – not least a dynamic, complicated female lead who has more to do than lie around – the plot can occasionally feel cluttered as a result, especially in the second half. Unfailingly enthusiastic performances from the whole cast keep the show driving forwards, but like the overgrown trees encircling the palace, it could benefit from a little pruning. That said, it’s a gorgeous piece of storytelling – and not without a message. As theatres wheel out the same stories year after year, the Bristol Old Vic’s novel approach is a reminder that we always have a choice about how to tell them. If any persuasion were needed, Sleeping Beauty makes the case that stories this old are ripe for retelling.